Agreed. The method of repair would depend upon what parts became moist, how moist, and whether they molded, warped, cracked, corroded, stiffened, delaminated, or otherwise failed. Hygroscopic moisture can persist a very long time in tight spaces beneath screw heads and tight seams causing problems down the road. Forcing it to dry might cause it to dry unevenly causing other problems. If you have a nice instrument that you'd like to preserve, I'd consider getting into a shop for a thorough go over. To add to the list of instruments for the rain, I'd like to add spoons, washboard, and voice. Bellows Notation - Generally Accepted Standards? I definitely like the idea of the < and > symbols, but > is already a musical symbol. I'm making some arrangements of classical music for EC, and so this is of particular interest to me. I'm using EasyABC, which has a great ABC editor and has pretty sharp rendering algorithms. ABC has limits, so I am just using the up and down bow symbols from strings. Up being pull and Down being push. I'm not complaining about ABC, I love that it makes laying music out so widely accessible with common tools. 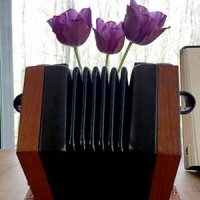 Playing the cello (in my mediocre fashion), the down-bow has a lot more power, which reminds me of the push on a concertina, so that's why I chose that particular symbol assignment. I agree that indicating bellows can make much clutter in a layout, but much like fingerings in some piano scores, if it is indicated only where it is either complicated or of strong preference to the arranger, it may not clutter so much. 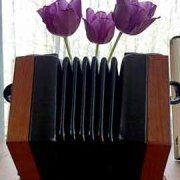 Here's a shot of how Regondi does it in an EC tutor: And Crabb in an Accordion tutor: (the V is push) And the American Accordion Association used arrows in 1938. In my notes I presently use bowing notation. What about three symbol notation, push, pull, and doesn't matter. Maybe: ⋃ for push - concave for reducing the bellows, ⋂ pull - convex for inflating the bellows, and ‖ for end of bellows instruction. Those seem easy to write, they are accepted digital characters (not to ABC, though), and seem somewhat intuitive to me at least. Thanks, Wolf! Yes, I do hear some mushy peas in there. Not quite soup, but almost. I'll work it at different tempos and think of nice hard dried peas. Wolf: By the way, Ive been enjoying your recordings, thanks for sharing them with the forum. Have you any transcriptions? I'd love to see how you put the accompaniment together. Everyone: your comments are much appreciated. I play in a relative vacuum (there is some air, of course), so it's fantastic to get some feed back from fellow players. Thanks, Rod. A good suggestion. Will do! Thanks, John! I'll send you a PM. Thanks, psmooze. I just joined a group of musicians who play Scottish music in a casual setting, so that will certainly help. I also think playing like peas in a pod will help stabilize my tempo somewhat too. I'll look into the transcribe program. My son has something that he uses for his music practice, called something else, but id does a similar thing. Thanks! Thanks for the encouraging and detailed comment, Chas. I do appreciate it, and agree. I remember reading that peas in a pod passage in the Concertina Workshop book now that you mention it! I think also I would benefit from working with a metronome to help me regulate tempo. Sometimes my fingers run away from me if I have drilled a certain passage a great deal. Thanks again!